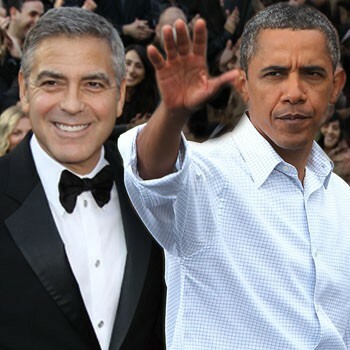 Far left Obama supporter George Clooney will hold fundraisers for Barack Obama in France and Switzerland in August. George Clooney has signed on for another special guest appearance as the Barack Obama re-election campaign takes its summer fundraising tour across the Atlantic in pursuit of Euro-cash. The Obama campaign posted an invitation on its website Friday revealing that the presidential pal-in-chief will appear at a pair of Americans Abroad for Obama events Aug. 27 in Geneva, Switzerland. Clooney, who usually spends summers at his villa on Italy’s Lake Como, made a similar appearance across the Swiss border on behalf of then-candidate Obama during the run-up to the 2008 general election. Charles Adams, co-president of the campaign’s European outreach effort, told the newspaper Tribune de Geneve that Clooney will address a crowd of about 150 at an evening reception, which will be followed by a more intimate — and expensive — dinner at which the star will be the guest of honor. Tickets for the latter event will go for $20,000 for singles and $30,000 for couples. Meanwhile, the Continental branch of the Obama fundraising effort will kick off next week in Paris with an Independence Day reception at the Rosenbloom Collection on the chic Rue du Chevaleret. Organizers Forrest Alogna, Pamela Boulet, Zachary James Miller, Valerie Picard, Joe Smallhoover and Curtis Young will host an early-evening event whose ticket prices range from $250 to $1,500. It may be difficult to find US donors in Europe. More than 1,780 U.S. citizens renounced their citizenship last year. This is up from 200-400 a year before Obama came into office.